In the days after consigning the Iron Lady to eternity, the British flocked to the cinema to catch the latest instalment of the Iron Man franchise. Iron Man 3, in which Robert Downey Jr plays the rust-prone Marvel superhero who has considerable difficulty with airport security scanners, topped the UK box-office in its first week of release. Nobody ever went broke underestimating the intelligence of cinema audiences, and the success of Iron Man 3 maintains the trend of increasing puerility in Hollywood blockbusters. Comic-books have become a fertile source of material for the movies, and although there are plenty of men (always men, many of them resembling 'Comic-Book Guy' from The Simpsons) prepared to make a case for the depth and sophistication of comics, they are essentially escapist pulp for adolescents. It's a lucrative market. Iron Man 3 made £13.7 million in its first five days of business, a total only topped by another Marvel production, Avengers Assemble, which made £15.8 million in its first weekend. It's hardly surprising if the Disney production goes for familiar action-thriller cliches, with Downey's metallic hero Tony Stark fighting the (inevitably British) super-villain, played by Ben Kingsley, who, like Downey, was once a serious actor. Most Hollywood critics, inured to the inanity of mainstream cinema, have been kind, relieved that the third film was not quite so cynical a cash-in as Iron Man 2. They have seized on the few moments of humour as blessed relief from the relentless clanking of heavy metal. 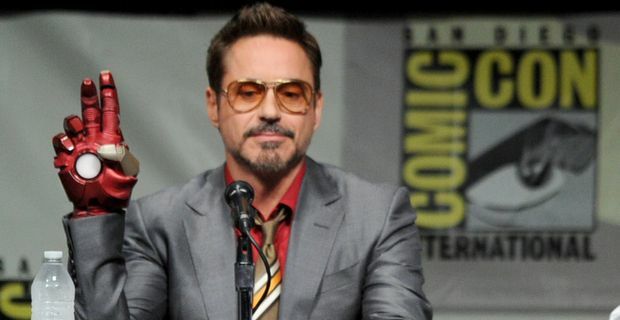 The Village Voice review mildly suggested that Downey might be advised to refresh his career outside the metal suit: "Perhaps even he is exhausted by the too-muchness of Iron Man 3 and its ilk." The box-office doesn't lie though, and it seems that the popcorn-scarfing, Coke-swilling denizens of the multiplexes can't get enough of the loud bangs and kapows of the comic-book adaptations.